Iowa's Kris Bryant and Rochester's Alex Meyer start the season with the same Triple-A clubs they starred for in 2014. Enough questions. Enough predictions. Enough meaningless games on the backfields. Enough snow, too. Let's get some answers. Let's get some spring. Let's get some baseball. And so it shall be, starting Thursday in the Minor Leagues, when 120 teams -- that's four full-season affiliates for each of the 30 Major League organizations -- take the field for the first time in the 2015 season. That can be a lot to take in over the course of one day. So MiLB.com wants to help you through what should be an exciting and chaotic first day of Minor League regular-season baseball. 11 a.m. ET: With apologies to our loyal followers in Hawaii, Alaska and abroad, you're probably awake at this point, no matter what shining sea, purple mountains or amber waves of grain are near. But there are still a few more hours before any kind of first pitch. Best to keep busy. How to do that? Start with the MiLB basics. Make sure you've downloaded the MiLB.com First Pitch and Inside the Park apps on your mobile device. First Pitch provides an easy way to follow box scores, news and notes from across the Minor League landscape, and in a change for 2015, the app will feature push notifications to alert you about breaking Minor League news (e.g. Major League promotions, big-time performances from big-time prospects, no-hitters in progress, etc.) as it happens. You can also sign up for in-game notifications for any of 160 Minor League teams. 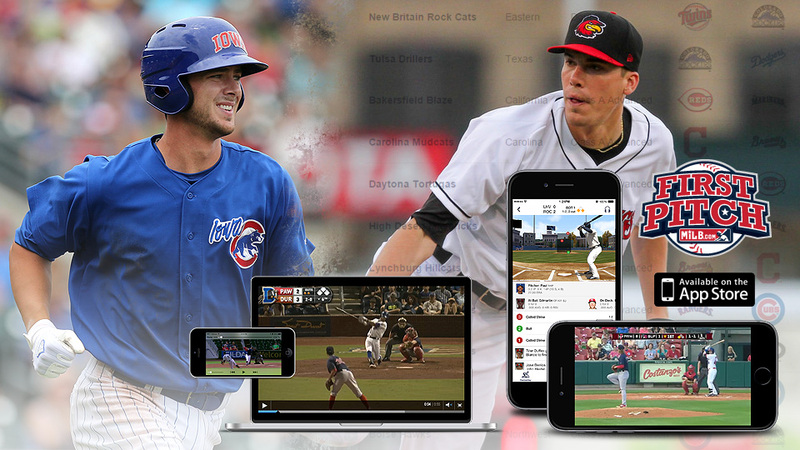 Once that's set up, be sure to have your MiLB.TV account set up. For $49.99 this season ($12.99 for one month), you'll have audio-visual access to more than 5,000 games, including every Triple-A game and contests involving every Double-A squad and select lower-level teams. That's a full slate of Minor League Baseball for the price of four movie tickets. Follow your hometown club on the road or get first-hand scouting reports for when your favorite prospects make The Show. 11:05 a.m. ET: Yes, this is only five minutes later because that's all it should take to download the apps and sign up for MiLB.TV. It's just that easy. With those tasks completed, might we recommend turning to some pregame reading, namely our Prospect Primers series. That's where you'll find that Tyler Glasnow could shoot up the Pirates' ladder after two years of being held back, why Byron Buxton might be a little "rusty" in his return to Double-A and what new Dodgers director of player development Gabe Kapler had to say about left-handed wunderkind Julio Urias. If you tend to follow a specific Minor League team, you might find our league previews -- like this one on the PCL and its many changes -- more to your liking. What's the biggest storyline in each circuit? Noon ET: If you're not a regular reader of Ben's Biz Blog, now is the ideal time to rectify this. Written by MiLB.com's Benjamin Hill, this frequently updated and often uproarious blog is dedicated to covering the business and culture of Minor League Baseball. Food, promotions, mascots and logos are discussed regularly, but during the season the bulk of Ben's content is dedicated to his on-location reports from Minor League ballparks throughout the country (check out his 2015 road trip itineraries HERE). If the idea of "exploring America through Minor League Baseball" appeals to you, then make sure to read Ben's Biz Blog throughout the season. And, as an added bonus, veteran MiLB.com scribe Ashley Marshall also will be contributing to the blog this season. His first post took readers on a Pac-Man-inspired tour of the Minor League landscape. 1 p.m. ET: One hour to go. Instead of watching the clock, be sure to bone up one last time on all of the affiliation changes that went down in the offseason. The Pacific Coast League, in particular, saw major turnover as six teams have new big league parents for the 2015 season. Still think Oklahoma City is connected with the Astros? Nope, it's with Dodgers and has changed its nickname to the same as the big club. Buxton and Miguel Sano once plied their trade in Double-A ball in New Britain; now they're in Chattanooga -- without getting traded. You know what, why don't you just bookmark the above link for easy reference, not only on Opening Day but the entire season. Just to be safe and all. 1:30 p.m. ET: Grab some nachos or a hot dog for lunch. Baseball goes better with both. 2:05 p.m. ET: To paraphrase the legendary Vin Scully, "It's time for Minor League Baseball!" (Go ahead, read that back in Vin's voice. It'll make you feel cozy inside.) The season begins at Buffalo's Coca-Cola Field as the Bisons host the Rochester Red Wings in a battle between the International League's Western New York clubs. Twins top pitching prospect Alex Meyer, who posted a 3.52 ERA with 153 strikeouts over 130 1/3 Triple-A innings last year, gets the ball for the visiting club, while the hosts counter with Andrew Albers, who returns after spending a season in South Korea. Albers was last seen in Triple-A with -- wait for it -- Rochester in 2013, for whom he had a 2.86 ERA in 132 1/3 innings. This Minor League opener will be available on MiLB.TV and online through TuneIn. If you're at work and are worried your boss wouldn't like you watching/listening to baseball, just keep a tab open on the Gameday box score. It'll be our little secret. 6:35 p.m. ET: If you're a regular visitor to MiLB.com, chances are you're interested in learning about top prospects as they climb the Minor League ladder. But let's face it: for many fans attending Minor League games, the action on the field is secondary to the family-friendly entertainment experience. The West Michigan Whitecaps have long been trendsetters in this regard, and their Opening Day festivities are among the best you'll find. Come for the team logo mittens giveaway, stay for the Dixieland band, zoo animals (including a Mexican porcupine), face painters, stilt walkers, jugglers and, of course, postgame fireworks. This also represents the first chance to sample the Whitecaps' new concession items, including "Hot to Tot" Buffalo-style tater tots (pictured below) and, for dessert, Nutella Poppers. 6:35 p.m. ET: A couple of New England-area feline franchises kick off the season, with the New Britain Rock Cats visiting the New Hampshire Fisher Cats. This is the first season in which the Rock Cats will be a Rockies affiliate, but, more importantly, it will mark the last in which they will call New Britain home. At the end of the season, the team will relocate a mere 12 miles and rechristen itself the Hartford Yard Goats. Therefore, the 2015 season is an opportunity to say a prolonged goodbye to the Rock Cats. The team began play in 1983 at Beehive Field, moving next door to New Britain Stadium in 1996. It was a Minnesota Twins affiliate from 1995-2014, and notable alumni from that time include David Ortiz, Torii Hunter and A.J. Pierzynski. 7:30 p.m. ET: The Biloxi Shuckers, Double-A affiliate of the Milwaukee Brewers, make their franchise debut in Pensacola. That's a situation they'd better get used to. The Shuckers, who previously existed as the Huntsville Stars, won't have a home until at least June 6 since Biloxi's MGM Park remains under construction (check out what it looks like right now). Therefore, their "home" games over the first two months of the season will be played in a variety of locales. Their April 20-24 series against the Jacksonville Suns will be played in Jacksonville, the May 6-10 series against the Mississippi Braves has been shifted to Trustmark Park in Pearl, Mississippi, and at least 15 games will be played in the franchise's former home of Joe Davis Stadium in Huntsville. If all goes according to plan, the Shuckers will play their first true home game June 6 against the Mobile BayBears. Keep your fingers crossed. 8:05 p.m. ET: The topic was discussed most of the offseason; then everyone discussed it during Spring Training. Now everyone gets to see it: Kris Bryant in a Cubs uniform; well, an I-Cubs uniform. MLB.com's No. 2 overall prospect, who famously hit .425 with nine Cactus League homers, suits up for Triple-A Iowa against the Memphis Redbirds. Don't be surprised to see more fireworks from Bryant. The right-handed slugger went deep in his first at-bat of 2014 with Double-A Tennessee. 10:05 p.m. ET: It's down to the final two MiLB.TV games of the night, with Las Vegas visiting Fresno and Sacramento hosting Salt Lake. Take your pick. Steven Matz, MLB.com's No. 67 overall prospect, brings some intrigue for Mets fans when the 23-year-old left-hander makes his Triple-A debut with the 51s. In Sacramento, Andrew Susac -- the Giants' second-ranked prospect and backup catcher during the club's postseason run last fall -- heads the River Cats' new era of affiliation with their Northern California brethren. 1:30 a.m. ET: Technically, it's no longer Opening Day. Unless something crazy has happened on the West Coast, the night's affairs are probably wrapped up. But our MiLB.com coverage hasn't stopped as game stories, highlights and breaking news are being posted. Catch up on what you missed during the first day of the Minor Leagues. We've got you covered, as we will all the way into September and the offseason. But for now, it's on to Day No. 2. Sam Dykstra is a contributor to MiLB.com. Follow him on Twitter, @SamDykstraMiLB. Benjamin Hill is a reporter for MiLB.com and writes Ben's Biz Blog. This story was not subject to the approval of the National Association of Professional Baseball Leagues or its clubs.